Semipalmated Plovers are easily identified, small shorebirds found in Tennessee during migration. They nests across northern Canada and throughout Alaska, and are one of the more common shorebirds seen in winter on the Atlantic, Pacific, and Gulf coasts. Unlike most plovers, Semipalmated Plovers appear to be increasing in numbers, perhaps owing to their versatility in food and habitat choice, their widespread coastal winter distribution, or their recent habitat expansion in the sub-Arctic as a result of disturbance caused by both humans and arctic geese. Description: This small shorebird has a short neck, is brown on the back and wings, has a single wide brown band across a white chest, and has a small white patch on the face above the bill. In fall, the bright orange bill turns dark and the legs become a duller yellow. Males and females look similar, and juveniles look similar to nonbreeding adults, however the wing feathers often have some pale buff fringes that give the bird a scaly appearance and the breast band may be interrupted. Voice: Flight call is a short, husky whistle chuWEE or kweet. Killdeer is much larger and has two distinct breast bands. Piping Plover has a pale back, a thinner, less complete breast band, lacks dark in the face, and is very rare in Tennessee. Habitat: During migration, they frequent a variety of wetland habitats including open mud flats, lake edges/shorelines, open ponds with shallow water, and large sand bars (i.e. Mississippi River). 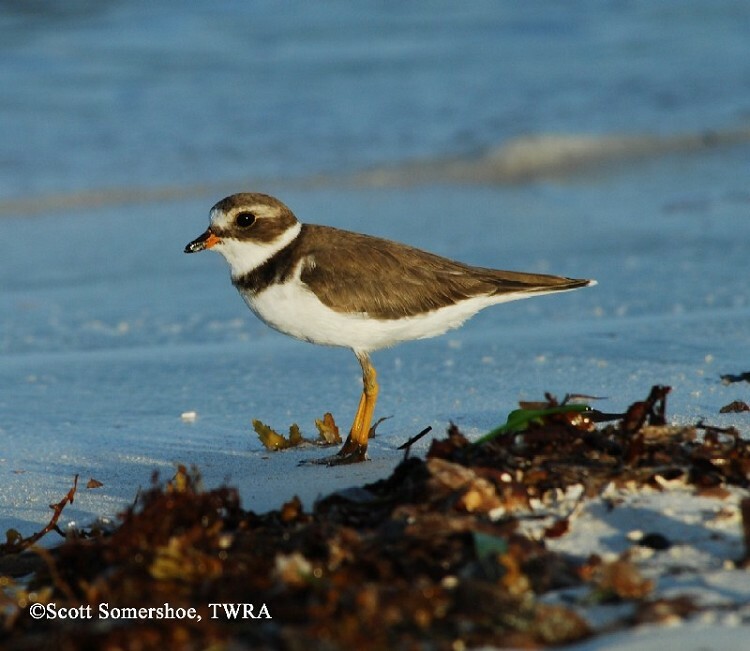 Nesting and reproduction: The Semipalmated Plover has not been documented nesting in Tennessee. Status in Tennessee: Semipalmated Plovers are widely dispersed, and a fairly common migrant shorebird in Middle and West Tennessee, but less common in East Tennessee. They are typically not seen in large numbers in any one location. In the spring they are generally found in Tennessee from mid-April through May and in the fall from late July through October. There are very few records of individuals in the winter or summer months in Tennessee. The term "semipalmated" refers to the webbing found between all 3 front toes. The Semipalmated Plover has been seen to swim short distances across small water channels while foraging and chick can swim short distances to follow parents to small islets on shallow lakes. Best places to see in Tennessee: In spring and fall, seek out open mud flats and sand bars in Middle and West Tennessee. Ensley Bottoms, Rankin Bottoms, and Tennessee National Wildlife Refuge units. Nol, E., and M. S. Blanken. 1999. Semipalmated Plover (Charadrius semipalmatus). In The Birds of North America, No. 444 (A. Poole and F. Gill, eds.). The Birds of North America, Inc., Philadelphia, PA.